Soon Huat Satay Beehoon has withstood the test of time with more than 50 years in history. Like any Chinese immigrants. 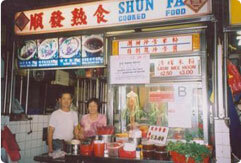 the founder- Mr. Goh Hong Yam started back in 1960's after migrating from China to Singapore for a better living. To make ends meet, initially he sold street hawker food for a living .